NH 24, Akshardham Setu, New Delhi 110092. ‘Swagatam’- Welcome! Inside the campus, you will be greeted by the Welcome Gates followed by Bhakti Dwar. Passing through a Visitors' Center, you can stop by to seek assistance from a volunteer to plan your visit or get a printed guidebook. Enjoy intricate carvings of Mayur Dwar and make a wish at Charanarvind - Holy Footprints. Offer your prayers to the deities in Garbhagruh, get blessed by the Mandapams - carved ceilings. On the first level, stroll outside through the Narayan Peeth - the bronze relief work. On the outside walls at the ground level, walk with elephants and experience their stories in Gajendra Peeth. Participate in a prayer for peace and for fulfilment of your wishes. Be part of a spiritual ritual and offer holy water to Neelkanth - the teenage-yogi form of Bhagwan Swaminarayan. Artistically mesmerizing, scientifically stunning, culturally moving, and spiritually elevating, the exhibitions create amazing environments capable of transporting viewers to ancient India. The exhibitions are comprised of three parts: Sahajanand Darshan – Hall of Values; Neelkanth Darshan – Large Format Film ;Sanskruti Darshan – Cultural Boat Ride. Sahaj Anand - A breathtaking spiritual multimedia water show. Multi-color lasers, video projects, underwater flames, water jets and surround sound in symphony with lights and live actors produce a captivating and inspiring presentation of an important story from the Kena Upanishad. A visit to Swaminarayan Akshardham’s two thematic gardens is a conversation with nature, history and culture. Learn about inspiring children, men and women from Indian history at the Bharat Upvan. Imbibe the wisdom of great minds from around the world at the Yogihriday Kamal. Available at the Visitors’ Center, Food Court and Exhibition exits. Pure, fresh vegetarian food and snacks are available at Premvati Food Court. Security measures are mandates by government law enforcement agencies. Please cooperate with security procedures and personnel. During peak season times and holidays, entry and waiting lines may take some time. We ask for your patience and cooperation in keeping Akshardham and all visitors safe. Please take care of your personal belongings. Baby Food and water bottle are subjected to further check. For a quick and smooth security check, we request you not bring these prohibited items with you. If you do happen to bring these items with you, please check them into the free cloakroom before entering the security check queue. The Mandir is a sacred house of God and a place of daily worship. To preserving its sanctity and spiritual ambience, a strict dress code operates within the complex. Sarong: In case your dress does not comply with above requirement, a free sarong is provided for your visit (Refundable Deposit Rs. 100) Please return the sarong at the exit. Entry to the mandir complex and mandir darshan is absolutely FREE and requires no prior appointment. All our volunteers and staff’s assistance is also free of charge. 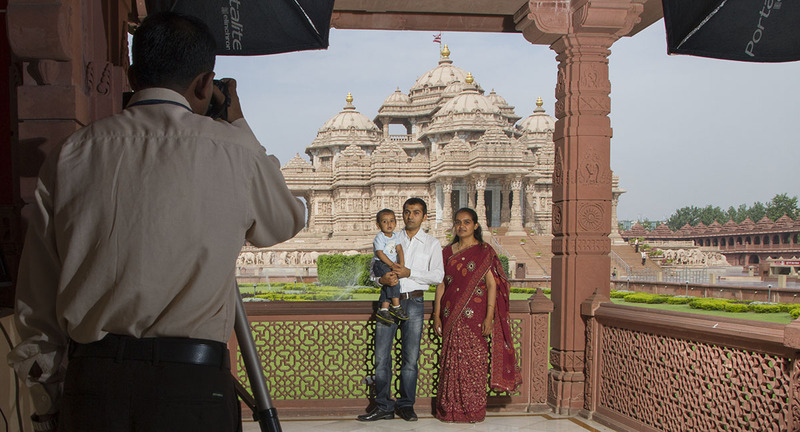 Capture your memories at Akshardham with a special photo from a vantage point in the campus. Printed Time: Within 20 minutes. Print Pickup: Available at the Book and Gifts Center (before exiting). Enjoy pure, fresh, vegetarian cuisine at the Premvati Food Court. In the ambience of the caves of Ajanta, enjoy Indian or Continental food of your choice. 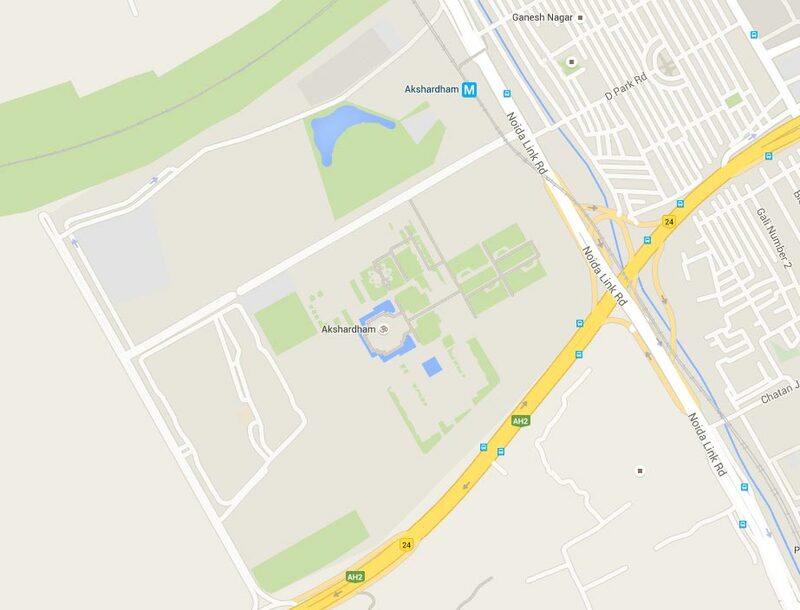 School groups and groups over 50 people are advised to contact Akshardham ahead of time. The Akshardham Books and Gifts Center offers a variety of publications – books, audio or video – and souvenir items as well as authentic Ayurvedic supplements and puja materials. Pick up your photo memory or choose another special way to remember your visit to Swaminarayan Akshardham.